Running an aquarium requires a lot of attention to the health of the animals. This fun-filled, hands-on camp will introduce you to animal husbandry and take you behind-the-scenes to meet the staff responsible for animal health and see how we care for the variety of animals in our collection. We will compare the anatomy of different animals, perform a squid dissection to understand the variation in body systems, observe a penguin health examination, learn how we give our animals medicine, discuss different methods of feeding different animals, and create a toy for one of our animals to play with. 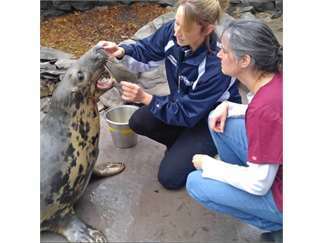 By the end, participants will have a well-rounded understanding of animal care.